While much of the work in organizations is delegated as direct output – “I’m delegating this to you and you will do it” – most requires some form of cross-functional support for success. The same principles that apply in terms of managerial accountability and authority when delegating work vertically through the organization cannot be applied to cross-functional work, yet organizations often make this mistake. This leads to unnecessary confusion, miscommunication, inefficient processes, and conflict. Finding the Effective Point of Accountability® for the flow of work across the organization involves understanding cross-functional accountabilities, authorities and the context and boundaries of work in a system. Even with something as simple as performance management where managers are accountable for managing their direct reports, for work to be done well, it needs to be done within a system. In other words, the HR department has some accountability with respect to the system, perhaps with accountability to implement and monitor the performance management system; to train employees; and to receive, record and submit information to the proper parties. The work system encompasses multiple departments and multiple levels. But HR is not the “boss” of the managers, and so cannot instruct them on what to do. Nevertheless, the professionals in HR have some very real accountabilities that are cross functional in nature. We call these cross functional accountabilities and authorities. Get the full White Paper in a downloadable PDF for only $1.95 or email me and I’ll send you a free copy. But identifying these cross-functional accountabilities and authorities poses a real challenge in establishing the EPATM. When different departments have a stake in a specific process or system, how does an organization decide whom has the final say? To continue the performance management example, if an Operations Manager doesn’t complete the required performance management meetings according to schedule, her incompetence will cause problems in the work system. If HR is accountable for monitoring the performance management system, they may pressure the manager to hold the meetings. If she refuses, however, how will the company resolve this issue? The Operations Manager feels accountable to her manager, not to HR – and yet her work (or lack thereof) directly affects HR’s ability to deliver performance management result for the year, which could have an impact on other systems, such as annual compensation adjustments. Who has the ultimate authority? When it comes to identifying cross-functional authority to resolve these types of issues, where the flow of work is across the organization, the single point of authority is the position in the organization that has the authority to decide and direct. In this particular example, which single position has the authority to decide what the outcome should be, and then direct everyone concerned to comply? The VP of Operations can decide and direct for Operations, but not for HR. The VP, HR can decide and direct for HR, but not for Operations. In this case, only the CEO has the authority to make a final decision and to direct people to act accordingly. That’s not to say that CEOs need to be more involved with the minutiae of day-to-day systems. But it does mean, that with cross-functional work, if there is an issue that causes churn in the organization, it may require ultimate attention from the CEO to make a decision rather than leaving people to “work things out” when in fact they don’t have the authority to make a decision that is best for the company overall. In a work system with cross-functional accountabilities, it’s often challenging identifying where the Effective Point of Accountability® lies. 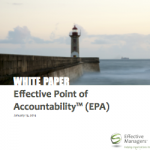 A general rule of thumb is that when work is delegated across rather than down the organization, the EPATM is higher than most anticipate, simply because of the authority needed to set appropriate context for the many involved departments. An effective strategy to identify the right alignment for the EPATM is to determine who has the authority to “decide and direct” with respect to the successful completion of the task. This is the position in the organization that will have the appropriate perspective and knowledge to act as the authority on that specific item. A well thought-out EPATM means more clarity, context and accountability for all employees, which in turn leads to more efficient operations and less conflict. This does not mean that elements of the work cannot be delegated lower; in fact, for success, elements must be delegated lower. But it does mean that for any significant cross functional process, it is important to identify that lowest position in the organization that has authority over all of the involved positions, i.e., can decide and direct.